LISTERINE TOTAL CARE "GENTLE REMINDERS"
Listerine Total Care is a product unique to any other Listerine product in their line...it isn't JUST for freshening breath. It does everything from keeping pesky cavities at bay to getting your teeth enamel back to what they were in your glorious 20's. So, we decided to remind everyone of just that, along with a little help from mom. 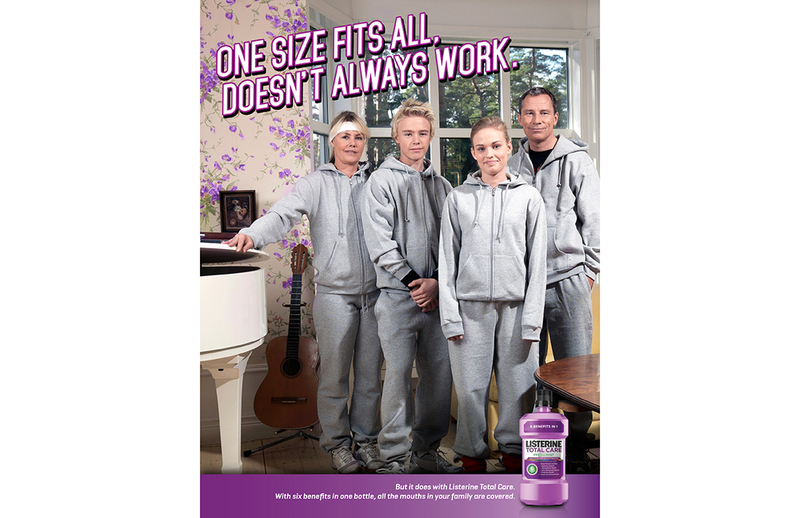 LISTERINE TOTAL CARE "ONE SIZE FITS ALL"
In our Listerine Total Care print campaign, we showcased the multitude of benefits in a way that infused some much-needed humor into the brand. With the many benefits of this particular line of mouthwash, it makes sense for every member of the family...although, that line of reasoning may not always quite work out when it comes to other things for your family.